When I was a graduate student, I was given to understand that the reason why so many Canadian economists worked with American data was that US-based journals weren't interested in publishing work done using non-US data. This impression was of course completely wrong. If anything, US journals (and their referees!) seem to have a prejudice in favour of work that isn't based on well-scoured US data. The problem is getting hold of the Canadian data in the first place. Early on in my career (before the www), I learned that if you called the BEA or the BLS for data, you got it. When you called StatsCan, you got a price list. Of course, for those of us who work at places such as universities or other institutions who are willing to pay for the CANSIM subscription, this doesn't matter very much. But for those of us who are interested in raising the level at which the discussion of economic issues takes place in Canada, it matters a great deal. As it is, there aren't enough people who would take the time to check out factoids that don't pass the sniff test (example), so making them pay for it is just making a bad situation worse. From the Policy on Dissemination, Communication and Marketing Policies: Statistics Canada provides information of broad interest to the public free of charge and recovers the costs of providing specialized information service in compliance with federal government legislation and policies on communications and external charging. The Agency strives to provide Canadians with broad, free access to basic statistical information from all of its programs. The expanding content on the web site, free electronic publications and the DSP are mechanism through which this objective is being met. However, for more detailed and specialised data needs, Statistics Canada offers specialized products and services on a cost-recovery basis to those who require them. Cost-recovery ensures that the special needs of smaller groups of users are fulfilled without subsidization by other taxpayers. Cost recovery also allows the Agency to expand its line of products and services by requiring them to be self-funding. As a result, cost-recovery imposes a rigorous discipline on the development of products and services: They must recover their costs, which in turn requires that they find a market of sufficient size to generate the revenues offsetting the costs. Clearly, the marginal cost of supplying GDP data is zero: the numbers are already there in the database. So why are they using average cost pricing? I noted earlier that average tax rates in Canada are an approximately constant fraction of income. What about marginal income tax rates (MITRs)? Federal officials have told Industry Minister Maxime Bernier that Ottawa should encourage more foreign takeovers and other investment from abroad, despite public concern that corporate Canada is being gutted by a flurry of acquisitions. Internal government documents, prepared earlier this year for the Harper government, say takeovers and other foreign investment provide "net benefit" to Canada and that the government should consider further reducing restrictions. One internal document, which was marked "secret" and written on Jan. 11, 2006, a couple of weeks before the Conservative election win, said Canada has "lagged behind" in reducing foreign investment restrictions. Some parts of the documents were blacked out by government officials before they were released, but the Jan. 11 document concludes that Canada needs more multinational corporations, whether they're foreign-owned or not.One document cites a recent OECD study that found that Canada has the second-highest level of foreign ownership restrictions among the group's countries, after Iceland. But economist Armine Yalnizyan, also the director of research at the Community Social Planning Council of Toronto, said there are legitimate social reasons why there are restrictions on foreigners controlling sensitive sectors, even though foreign investment does spur economic growth. "All citizens need access to basic services." Faithful readers of this blog will of course recognise that the article is old news; there are any number of publicly-available studies that say the same thing as this Top SecretTM document. But I'm guessing that an article with the headline "Cabinet Minister Given Sensible Advice by Competent Professionals" wouldn't interest the Globe. If the Globe - or any other media outlet, for that matter - wants to be taken seriously, it should spend some time trying to understand the analyses that are already public, and less time putting breathless spin on Top SecretTM documents that say the exact same thing. Frank Vermaeten, W. Irwin Gillespie, and Arndt Vermaeten, “Tax Incidence in Canada,” (1994), Canadian Tax Journal, vol. 42, no. 2, pp 348-416. Sadly, there appears not to be a version of this paper on the internet, so I had to actually go to our library to take a look. It was well worth the trip, because their results aren't what I was expecting at all. Bloomberg: Canadian Dollar Still Undervalued After Rally, Memorandum Says: The Canadian dollar is undervalued and doesn't yet reflect the benefit to the country's economy from soaring energy exports, according to an internal Bank of Canada report written in March. The currency's "long-run equilibrium value'' is 91 U.S. cents, central bank researchers Jeannine Bailliu and Ramzi Issa wrote in a March 27 note to Bank of Canada Governor David Dodge and his five deputies. The six-page document was obtained by Bloomberg News under the nation's Access to Information Act. The Canadian dollar climbed to a 28-year high of 91.44 cents on May 31 before retreating to trade at 88.68 cents at 5 p.m. in Toronto yesterday. The report helps explain why Dodge raised interest rates in January and March to cool inflation even as provincial leaders, labor unions and manufacturers protested that the dollar would strengthen and erode demand for exports. No-one in their right mind - and this includes Jeannine Bailliu, Ramzi Issa and anyone who works at the Bank of Canada - would consider this number to be anything but the result of a few hours of fiddling with some off-the-shelf exchange-rate models. Bragging about how you had to use the Access to Information Act in order to get this Top SecretTM factoid is just embarrassing. The Bank of Canada goes to extravagant lengths in order to explain what it is doing and why: explicit inflation targets and regular updates about its views about the state of the economy. To suggest that this Top SecretTM factoid is the Secret Explanation to understanding the Bank's behaviour during the past few months is just stupid. Those who took the time to read what the Bank said about what it was going to do and why could predict - with virtual certainty - the Bank's decisions. Following a three-year study and discussion of the subject, the Ad Hoc Committee on Journals (Robert Hall [chair], Judith Chevalier, David Colander, Peter Diamond, Alan Krueger, and Daniel Rubinfeld) recommended to the Executive Committee in April 2006 that the Association start four aggregated field journals, each published in four issues per year. Each new journal will publish articles in a group of subfields with loose boundaries. The new journals are not subsidiary journals to the AER; each is of equal status. All four will begin publishing at the same time, probably in early 2009. Almost all other academic societies publish more than three journals. Adding more journals will increase the diversity of editors of Association journals. AEJ: Macroeconomics primarily would include: macroeconomics; monetary economics; international finance; aggregate aspects of development; economic growth; finance; and comparative economic systems. AEJ: Microeconomics primarily would include: microeconomic theory; corporate finance; industrial organization; micro theory aspects of economic development; and micro aspects of international economics. AEJ: Economic Policy primarily would include: public economics; urban and regional economics; public policy aspects of health, education, and welfare; law and economics; economic regulation; and environmental and natural resource economics. AEJ: Applied Economics primarily would include: labor; demography; empirical micro development; and health, education, and welfare economics. This is excellent news, as anyone familiar with Ted Bergstrom's work on journal pricing will agree. Increasing the number of reasonably-priced, high-quality journals can only be a good thing. Although the Bank of Canada and the Fed have both chosen to stop increasing interest rates, they did so for very different reasons. When the Bank of Canada called a halt to interest rate increases last month, it did so because it thought it had hit the sweet spot - inflation on target, output at capacity, and a level of interest rates consistent with staying there. The Fed isn't in the sweet spot, and with today's pause, it has decided that it can't get there on its own. Inflation is higher than the Fed would like, but it's decided to temporarily outsource reducing inflation to the anticipated slowdown. That may be a good decision for now (I personally was on the rate-hike side, thanks for asking) but it sets up an even harder problem for future decisions. Figuring out when the Fed's problem stops being one of dealing with a recession and goes back to being one of containing inflation will be a tricky business indeed. In retrospect, the Fed appears to have set interest rates too low, for too long during 2002-2004. 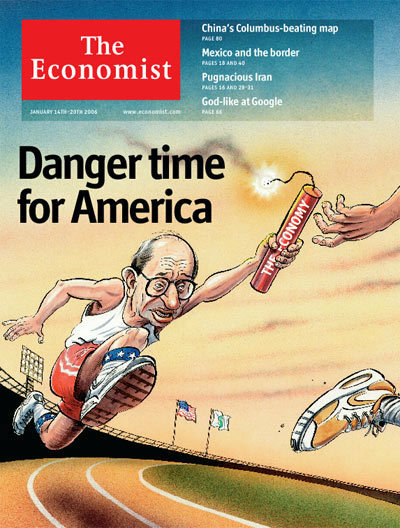 This Economist cartoon from last January is starting to look to be as good an assessment of the situation as any. We both did our MA at the University of Western Ontario during the academic year 1984-85. I'm pretty sure that Glenn Stevens was the best student of our cohort (I think I was second), and I remember him telling me that UWO tried very hard to persuade him to stay on to do a PhD. He thought that it would be a waste of time, since he wasn't interested in academia. Thinking of the Bank of Canada - where it's well-nigh impossible to go very far without a doctorate - I asked him if he was worried about limiting his options. He didn't think he was - and it turns out that he was right. In his picture, he has much less hair than I remember. But then again, so do I. Good on you, Glenn; I wish you well from the other side of the world.